Thanks to Post & Courier's photographer, Wade Spees, we get a glimpse of Stauch smiling large here in her element. CEO of Shark Marketing Co., Shari Stauch, has been a member of the Center for Women for six years. Her inspiration to join came from director, Jennet Alterman, who arranged a signing for Stauch’s book, You Can Do It. The book – a Mentor on How to Beat the Boys at Pool – triggered the Center for Women’s You Can Do It! Series. Stauch stands as the Treasurer of Strategic Planning & Finance on the Executive Committee of the organization. Stauch has utilized the Center for Women’s resources, attending multiple social events – from purse auctions to meet and greets to the annual Women in Business Conference to shopping – and making a close network of friends. When she’s not busy with her rapid career as an author, editor, marketing and PR professional, she enjoys reading, watching movies, spending time with her family and friends and of course – playing POOL! 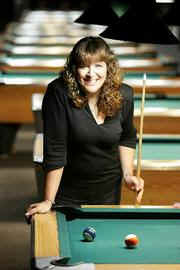 Stauch grew up in a billiard club and went on to play pro pool and become a member of clubs considered the, “last bastions of male dominance.” Her father taught her at an early age that, “people do what they want to do;” she used this to gain momentum and realized that she was the only person who was ever going to stop her. She has two children – a straight A student at Duke and a grad student at the Citadel – who she is, understandably so, quite proud of. What kind of message does successful Shari “the Shark” Stauch want to send out to women who are trying to succeed in today’s economy? Hundreds of women piled into the Women in Business Conference last Friday to hear inspirational speakers, participate in productive workshops and most importantly – share the opportunity to connect with other women both different and alike. The day kicked off with a convocation speech from Colonel Martha A. Meeker, Commander of the new 628th Air Base Wing that will operate Joint Base Charleston. Her inspiring talk was followed by the speed networking event, in which each woman was able to sit at a table, go around in a circle and introduce themselves. At the ring of a bell, women rushed to the second table and embraced the opportunity to meet others and emphasize the role each played in the rapid world surrounding her. The first event triggered a compelling, contagious “girl power” energy in the air, which grew throughout the conference. The fire peaked at lunch in large part due to our keynote speaker, Linda Tarr-Whelan who casually stated, “When a door opens, go through it.” In all walks of life, we are faced with opportunities, but we often times take difficulty in breaking the realm, the stereotype. Take a day to yourself, take the promotion, dive full force into whatever it is you think you MAY want to do…trust your instinct. No more second guessing yourself. “What’s the worst that can happen if you do go through the door?” Failure? The risk of being let down? If you fall, take all you can, learn and pick yourself back up. And that’s what Linda Tarr-Whelan’s speech emphasized. If we don’t break the mold and do what we innately know and feel is right now, when will we? A long path has been traveled but it in no way has been conquered. The vivacious energy throughout the conference sent off the poignant message that we should carry with us – throw your fist in the air and JUST DO IT! You may choose to leap, jump or take baby steps; there is no “right” way. Regardless of how long it takes, you are still taking the chance. Vulnerability is difficult for all of us, but even if you put yourself out there and fall, you will still gain. It is through experience that we become both stronger and smarter; how else do we learn? Go through the door, embrace your opportunities…Really, what do you have to lose?